I don’t think I know one individual out there that truly enjoys ironing. Standing at an ironing board for hours at a time, mindlessly taking out wrinkles, putting creased in trousers and making pleats look perfect and polished just does not seem like a great way to spend your free time. But alas the job won’t do itself, so why not have an iron that will get things done fast and easily? 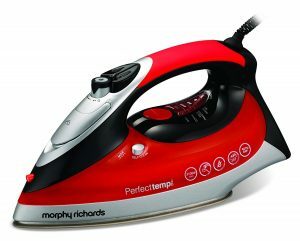 The Morphy Richards 30002 Perfect Temp Steam Iron has scores of great features to make this mundane chore a whole lot more bearable. With its Perfect Temp controls with easy to understand push button temperature selections, this iron looks like it can do it all. The buttons are marked according to clothes labels and the blue digital light detailing allows you to see exactly which setting you are on. No more accidentally hitting the dial and changing the required temperature prematurely. Positioned for easy access, there are settings for linen, cotton, wool, polyester, nylon and silk. With the 3100W power, the Morphy Richards 300002 Perfect Temp Steam Iron heats up faster than Grease Lightning. No more waiting around to see if you’ve reached the right temperature. It even gives a soft beep sound to let you know that its hit its temp mark! This power packed iron also has a 3m cord that will reach any outlet and allow you to do your ironing in any room of the house. 40g of constant steam makes those wrinkles disappear with ease and having a powerful steam boost of 190g takes the worry out of even the stubbornest creases. With a water basin that hold 350ml of distilled water, you will not have to worry about running out of steam! The sole plate construction is a trizone ceramic plate and features an added pressing plate that removes extra moisture. The turbo steam booster is placed at the tip of the plate and allows you to get into the difficult areas of garments like pleats, darts and collars. Weighing in at 1.7kg, this iron is a little lighter than most comparable irons on the market and glides just as well on any material. It comes with a3 year guarantee from Morphy Richards as well, which will take any anxiety out of the equation if any troubles arise. Piece of mind is always a good thing right? A self cleaning and anti scale feature both help in lengthening the longevity of your iron. But be advised that if you do not use distilled water and you have any issues with your iron at all, your guarantee will be null and void. So have a supply of distilled or ionized water on hand. One feature that the Morphy Richards 300002 Perfect Temp Steam Iron has that is quite different from other irons is the auto shutoff feature. 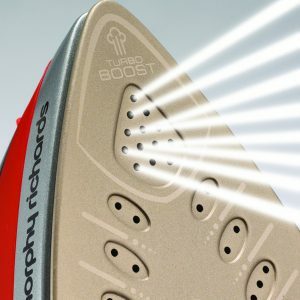 If the iron is left on its sole plate for more than 60 seconds without movement, it will automatically shut off. Similarly, if it is left on its heel for more than 8 minutes it will automatically shut off. 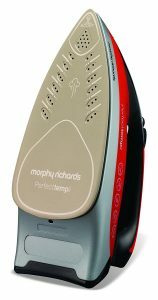 With very few issues besides occasionally dripping (which seems to happen with almost every iron in the marketplace) and reports of switching off early, the Morphy Richards 300002 Perfect Temp Steam iron is a sound investment if you are looking for a reliable iron. With its sleek design and bright red and black color combination, this iron is on point with the greenbacks you’ll have to fork out to purchase one. Its one of those small household appliances that may just be worth the cash.